Tony Blair has told MPs it would be "unwise and dangerous" for the UK to give up its nuclear weapons. 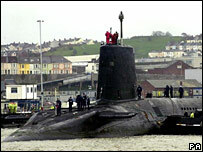 The prime minister outlined plans to spend up to £20bn on a new generation of submarines for Trident missiles. He said submarine numbers may be cut from four to three, while the number of nuclear warheads would be cut by 20%. Mr Blair said although the Cold War had ended the UK needed nuclear weapons as no-one could be sure another nuclear threat would not emerge in the future. The options of changing to a land-based, or air-based nuclear weapons system had been considered and ruled out. Instead the system would remain one based on a fleet of submarines which carry the Trident missiles, each of which can be fitted with a number of nuclear warheads. Mr Blair said between £15bn and £20bn would be spent on new submarines to carry the Trident missiles. The submarines would take 17 years to develop and build, and would last until about 2050. He said the UK would also join the US programme to extend the life of the Trident missiles until 2042 - and would then "work with" the US on successor missiles. A decision on the nuclear warheads themselves "is not needed now", Mr Blair said, although the white paper said a decision would be needed in the next Parliament. Mr Blair, who faces some opposition within the Labour Party to the plans, said there were "perfectly respectable" arguments about giving up nuclear weapons. But he said he had to make a judgement about the country's security and the consequences of misjudgement would be "potentially catastrophic". He denied that Britain was under an obligation to disarm under the nuclear non-proliferation treaty and pointed out that new threats were posed by states like North Korea. "In these circumstances it would be unwise and dangerous for Britain, alone of any of the nuclear powers, to give up its independent nuclear deterrent." He also said "it is not utterly fanciful" to "imagine states sponsoring nuclear terrorism from their soil". MPs will vote on the plans in March after a period of debate, he said. Conservative leader David Cameron said his party agreed with Mr Blair's position "on substance and on timing". "It is a vital matter for our national security but it requires a long-term approach. I hope we can work together on this issue for the good of the country," he told Mr Blair. But Liberal Democrat leader Sir Menzies Campbell said proper consideration of all relevant factors could only be made if the decision was postponed until 2014. He added: "Why is this decision being pushed through his own Cabinet, and through Parliament, just as the prime minister is about to leave Downing Street? Is this about Britain's interests or about his legacy?" Sir Menzies wants the number of UK warheads halved to 100 - a move he said could help kickstart multilateral disarmament. Among Labour MPs who oppose replacing Trident former minister Michael Meacher asked: "How can this proposal really be justified in an utterly different post-Cold War environment?" He argued that the move would restrict conventional defence spending, undermine the nuclear non-proliferation treaty and would take money away from the fights against terrorism, climate change and "long term energy insecurity". A group of 28 Labour MPs, headed by Gordon Prentice, have written to the general secretary of the Labour Party asking for "wider and deeper consultation" among party members and affiliated organisations. And Kate Hudson, from the anti-nuclear pressure group, CND, said she was "very very disappointed" with Mr Blair's announcement. "He talked vaguely about reducing the number of submarines and warheads but it is not clear what that would mean," she said. "I am sure many Labour MPs will be extremely angry because it is clear the prime minister has set out a pre-determined timetable." Who's been the best Dr Who?